Both experienced and novice shooters can learn life-saving skills from a defensive pistol class. I must admit that I've got a few miles on me. I've grown a bit of a paunch, my body parts don't work quite as well anymore, and my hair is turning gray, what's left of it. Some would call me old and others middle aged. AARP keeps trying to get me to join, which I won't, but that's another story. I've enjoyed shooting for nearly 50 years and have shot locally at pistol matches where I've beaten some and been beaten by others. So I guess you could say that I'm an experienced handgunner. Gunsite ranges are very well maintained and equipped. Under instructor supervision, half the class practices shooting techniques just learned, while the other half reloads and watches. Learning is constant, whether on the line or behind it. Nevertheless, I wanted to improve my skills and wondered if a basic defensive pistol class like the one at Gunsite Academy would help. Or was it just for beginners? I decided to find out. The Arizona high desert would warm into the 70s by afternoon, but this early October Monday morning was chilly. Sixteen students met in the classroom and began to get acquainted while sipping coffee and waiting for class to begin. We were professionals, business people and blue- and white-collar workers ranging in age from 20-something to mid-60s, but everyone had a strong interest in self-defense and guns, so there was immediate camaraderie. Schedules are important at Gunsite because there is a lot to learn in five days, so it was not long before the head instructor and range master for our group, Bill Halvorsen, convened class. The first item covered was safety. Accidents at Gunsite are very rare, and signs emphasizing the four basic safety rules hang everywhere. Entering a room is dangerous because it could be filled with bad guys. There is no time limit, but you can't wait forever if someone's life is in danger. 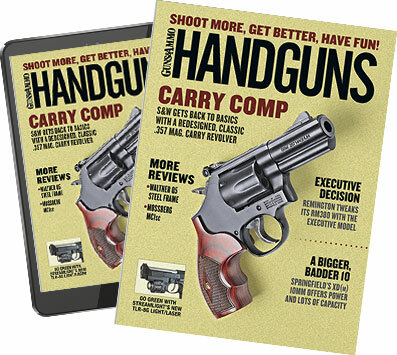 Next, gun-handling basics like the press-check for determining if a pistol is loaded, the basic draw and various types of holsters were discussed, although a strong-side belt holster was required for the class. Most students brought a 1911-style pistol in .45 ACP, but .40 S&W and 9mm chamberings were also present, as were Glocks and a double-action SIG. By mid-morning we were on the range, where we spent about 90 percent of our time. Instruction began by the numbers, first raising the gun from the ready position and then dry firing. This was pretty easy so far, but I had already picked up a few good ways to improve my technique. No one, young or old, was having trouble keeping up. Bill Halvorsen and our two other instructors, Eric Olds and Larry Landers, were excellent teachers with years of experience and strong backgrounds in law enforcement and the military. They knew how to teach and push students to improve, but they did it with respect, giving us our money's worth and more. On the outdoor simulator, students practice using cover and concealment while shooting the "bad guy" pepper poppers. Quality and consistency of training are paramount at Gunsite, so no matter who a student might get as an instructor, the lesson plan and material taught are the same. Even though we were all enjoying the experience, the skills taught here save lives, so the instructors take it seriously and teach accordingly. Range work continued throughout the afternoon of the first day. Ideas and techniques, some of which were new to me, were introduced and practiced by the numbers with unloaded guns until everyone did them correctly. Then we loaded up and practiced live fire, again repeating the movements many times, striving for proper form and not worrying about speed--that was to come later. Our instructors told us that by Friday we would all be able to draw and fire two shots into the center of a target at seven yards in 11?2 seconds. I have never been that fast, and I found the prediction a little astounding, especially for some of my classmates who were obviously not very experienced with handguns. We practiced focusing on the front sight and smoothly pressing the trigger until a surprise break was achieved. These are essential elements of the Modern Technique of the pistol as formalized years ago by Gunsite's founder, Jeff Cooper. Other elements include the Weaver stance, the presentation (or draw), a flash sight picture and a heavy-duty pistol. To help learn trigger control, we practiced pressing the trigger (gun unloaded) with an empty cartridge case balanced on the top of the pistol--another first for me. The object was to drop the hammer without causing the case to fall off. It wasn't easy, but we all got the hang of it, even me using the double-action SIG. By the end of the day, my old legs and feet were sore, but I was ready to go again the next day. Two types of flashlight holds are taught at Gunsite. Above is the Harries technique, and left is the Laser technique where the flashlight is held like a syringe. If you think these techniques are easy, think again. To do either one correctly takes a lot of practice. At 8:00 a.m. on Tuesday we started at the range, driving directly there instead of to the classroom. We reviewed yesterday's lessons, but the pace quickened and shooting distances increased. We were instructed in three types of reloads: tactical, speed and administrative, the latter being used when the gun was to remain holstered. A surprise to many, Gunsite runs hot ranges, meaning that guns do not have to be unloaded before leaving the firing line. Under stress, a person reacts the way he was trained, so we trained to keep our guns fully loaded and not develop the habit of unloading when the shooting was done. Doing that after a gunfight could be deadly if the bad guy is not really out of the fight or his buddies suddenly show up. joints began to remind some of us of our age, but allowances were made and alternatives offered by the instructors. We all got through the drills successfully. Gunsite has about 60 instructors, and 95 percent have either a military or law enforcement background, with about 60 percent having been involved in at least one gunfight. They knew what they were talking about when they told us to learn to do something instinctively because in a gunfight, we won't have time to stop and think about what to do. It occurred to me that this was more than a shooting or even a fighting school; it was really a survival school. In fact, at the time I write this, no Gunsite graduate has lost his life in a gunfight, which means something because Gunsite has been around for nearly 30 years and receives two or three letters annually from graduates who tell how Gunsite training saved their life. We learned to shoot around obstacles and clear an area, either indoors or out. Corners are very dangerous, so we were taught to slice the pie and search in rays. We went over concealment and cover and were introduced to the phrase Diligentia, Vis, Celeritas, meaning Accuracy, Power, Speed. These are essential to prevailing in a fight. The three styles of handguns in use by students are represented by the Glock 26 in 9mm, the SIG Sauer P229 in 9mm and the1911 Colt Series 70 in .45 ACP. By now, things were moving pretty fast and our improvement was remarkable, even for those of us who had been shooting for years. Then came the El Presidente drill, an exercise in which the student turns, draws, fires two shots into the center of each of three targets, reloads and shoots each target twice again, all in 10 seconds. Surprisingly, we got the hang of it pretty fast, including us old folks, and some even made the time. Before this class was over on Friday, we were to go through two indoor and two outdoor simulators, giving us experience in clearing buildings and outdoor areas. The principles were simple to understand but not easy to execute, and even though none of it required great physical exertion, heart rates usually increased, and the student felt stress during the exercise. That's good because it made training more realistic. When the time came, students went through each simulator one at a time accompanied by an instructor. Most rookies made the same mistakes, like forgetting where the front sight is or deciding that a good jerk of the trigger is better than the press-surprise break we'd been trying to master. Occasionally, a no-shoot target was shot, but it's better to make mistakes in the simulator than on the street where consequences are real. Most students were their own worst critic, but the instructors were very professional, and no one was embarrassed or ridiculed. By the time I was done, I was tired, winded, excited, enthused and ready to do it all again. It was a lot of fun. Gunsite firearms safety rules are posted everywhere and strictly enforced. To those who have never experienced shooting a handgun at night, the muzzle flash can be surprising and distracting. Interestingly, though, some people actually shoot better at night, perhaps because of fewer visual distractions or greater concentration on proper technique. It is not easy, especially when holding a flashlight. Both the Harries and Laser techniques were taught so the student could decide which one he or she preferred. It made for a long day, but no one complained. The last shooting exercise on the last day was the shoot-off, where we were subjected to the pressure of competition. At this point, everyone was confident of his or her abilities, so we all had a good time. Four pepper poppers plus a split one were placed 10 yards downrange, and two shooters took positions next to each other on the firing line. At the start signal, each drew and fired, knocking down (hopefully) their two pepper poppers, speed reloaded, then shot down their half of the split one in a race to finish first. Competition was tough, and some novices beat some experienced shooters. Surprising to me, the double-action SIG and thumbbreak holster I used proved not to be a handicap against single actions or Glocks, so I couldn't blame my shortcomings on that. I was beaten by some classmates but did not finish last, and I learned by experience that a major caliber has more pepper-popper knockdown power than a 9mm. Every one of us, from the youngest to the oldest, made it successfully to the end of the course. I was sure that even the younger participants had a sore muscle or two from the physical activity, and I noticed that about a third of the class was wearing bandages on fingers or palms to cover blisters from the cut checkering on their pistol grips. Still, no one complained, and smiles were everywhere. Windows are dangerous. Always be ready for a bad guy who might suddenly appear from outside. We were now members of the Gunsite Family, which includes people in almost every country in the world. With more than 1,600 acres and 25 ranges, along with a drop zone and helicopter landing area, Gunsite has trained some very special people who are now serving in some interesting situations solving problems regularly with the same skills we had learned. Even seasoned law enforcement and military personnel can improve their shooting and learn new things in the Basic Defensive Pistol Course, so don't think it is just for novices or civilians. People older than I and with minor handicaps can easily handle the physical demands; you don't need to be a gazelle to participate. Besides, where else can you go to have this much fun and learn something that may save your life?